What is it that captures your eye and attention when on the lookout for a new vehicle? Is it the performance, utility, and the subtleties of design that make you want to take a closer look? The Audi S4 has put a lot into its design to garner the attention of drivers far and wide. There are a vast array of things to appreciate about the new Audi S4. Once in the driver's seat, drivers will be greeted by a stellar steering wheel. This wheel is stylish in design with 3 spokes and a flat bottom. It is also equipped with controls for multiple functions and shift paddles so your hands never have to leave the wheel. There are also optional features and packages to accentuate the exterior even more. 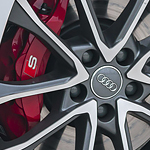 The S4 gets eye-popping Audi Beam features and 19-inch contrasting gray wheels with a design that's sure to turn heads from the moment you leave Audi Des Moines.